Something’s happened inside me lately, though, and I’ve become much more introverted – in a healthy way. My inner plateau has become my sanctuary, my safe place, and I’m guarding that comfort well. 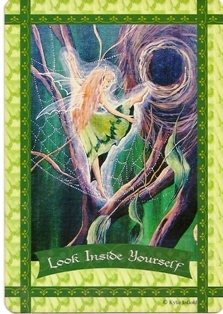 This card this morning reminds me of that faerie enchanted tree, and her message is extremely appropriate. I already have all the answers I need, even though I continue to ask the questions. It’s time to stop looking for answers in the advice, opinions, or desires of others – and start being contented with my own inner wisdom. Trust my own inner guide. Appreciate my own inner state of being. Card Meaning: You’ve been trying to find satusfaction through outside sources such as material possessions or relationships. You’re also looking for help from other people. The fairies ask you to look within for the answers you need. Description: Sometimes when you feel empty, your first reaction is to try and fill up the emptiness by acquiring something or someone. You may fall in the trap of thinking, “I’ll be happy if or when I have (a new lover, an advanced degree, a better wardrobe, etc.). Then when you get the new acquisition, you only feel satisfied for a little while. The fairies remind you that the only source of true fulfillment is by connecting with Spirit within. Have a mental conversation with your Creator, and feel yourself filled with Divine love.